I am creating a noir game in Renpy about gang culture and the morality of decisions for this jam. Very interesting. Looking forward to playing this as well. Hello, hello. I'm Plim, a freelance writer and independent filmmaker. I'm currently trying to build a soulslike in Twine but I love noir so I want take some time off from that to see if I can make something interesting for this jam. 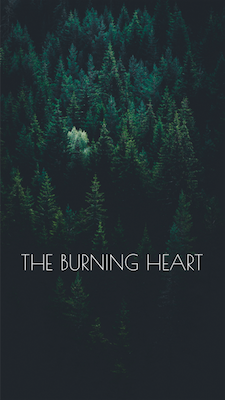 The Burning Heart, is an interactive story featuring Solomon Todd, a detective on the brink of retirement who has been forced to take a leave of absence after a case goes terribly wrong. Solomon drives into the countryside to clear his head. After a long day of driving he checks into The Golden Pine, a small motel in the heart of the forest. It soon becomes clear that something is off. A fellow lodger is found murdered, her body nailed to a tree. Someone has woven wildflowers between her toes and carved a strange message into her ribs. When you come up with a marketing thing and realise: that has to be in the game now. And unintentionally stumbling onto a defining moment is probably my favourite thing about writing. Hey folks, this will be my first game jam, and my first non-negligible attempt at IF. I'm writing a game in Twine about memory, aging, and loss, called The Residences at Redwood Grove. Thanks, Xian Xian, for hosting, and giving me the spark I needed to get this project started. Hi, my name is Kyle, and I just joined this jam less than an hour ago. I'm mostly using this jam as a vehicle to escalate my art skills. As I am primarily a programmer with a background in animation, I've never been behind the aesthetics of anything at a core level. I plan to change this, and this genre has struck a lot of inspiration in me. What I love about this jam is that it's a solid month long. I can't guarantee my entry's story will be great, or deep, or even possibly there at all, I may just have the time to create art assets and get the character to run around an environment, we'll see. Noir isn't even a genre I've strongly been interest in, so as I sit here and think of the story and characters, my inspiration comes directly from stereotypical sources of 50's style black and white / early colour detective sources. I have a laundry list of things I want to tackle for this regardless though. I'm psyched! Your excitement is infectious! Very interested to see what you'll put together. Also love that this is a whole month long. Though for me this allows more time to work on the story. Wish I could animate sigh. One day. Im 16 and i found this game jam through the haruki murakami subreddit, I am in a programming class right now but I think i am going to make my game in twine! I have not figured out exactly what I want to do but I will keep you all updated! I'm a bit late but I swear I didn't notice this topic (That tells a lot about my detection skills, I suppose). I'm StenoArtico, an italian writer/game designer. This is my first twine project and my first interactive fiction of a certain lenght. The title is Giallo and it's based on a slightly-modified version of a character I created for an imagined comicbook or tv series: Rino D'Ignoti, a synesthetic journalist framed for a crime he didn't commit, probably. The only thing that he remembers is the yellow silhouette of a man. It will have, I hope, all the staple noir things (flashy flashbacks, obsession, ambiguity) and I also want to use different text colors to give the story a unique look. On top of that I'm writing in english, which is not my mother tongue, so I mainly hope to make something readable. I'll probaby manage to release only the first act of the story before the deadline, but I plan to keep on writing and release it in the future.